Suppose you are in a DNA group that has some good matches. Suppose one of the people in your group has supplied a tree that does not meet your early ancestor and that person nor you knows exactly how you might match from a paper trail standpoint. On the tree side we always list kits together that can prove a paper trail to a given ancestor. Example, Here is group R1b-60- the kits in this group that include Reverend John Smith b c 1620 ENG match very well and are thus grouped together. If you click on the TREE icon by each kit it will take you to the early known ancestor that is presumably proven or the PEDIGREE icon to see the ancestral direct lineage . 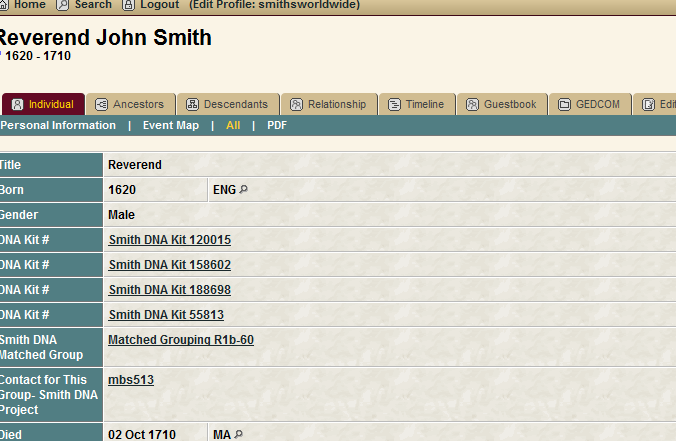 In the case of Reverend John Smith, there are 4 kits listed at the tree link with Rev Smith (see pic directly below), not the 7 that are on the DNA matched grouping report. 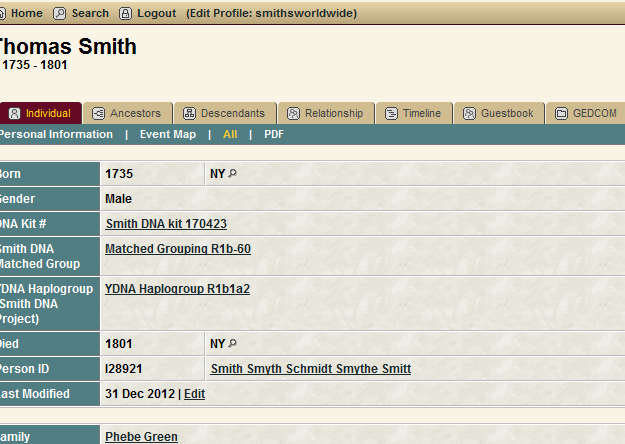 There IS a link to the Matched Grouping on the tree so that you can see if there are others that match EVEN IF IT’ S NOT KNOWN THAT THE OTHERS STEM DIRECTLY FROM JOHN SMITH (ie, the direct paper trail connection is not yet proven). Below is the link from the tree for Kit 170423, from Thomas Smith. This kit IS listed with the matched grouping but is NOT listed with John Smith on the TREE part. 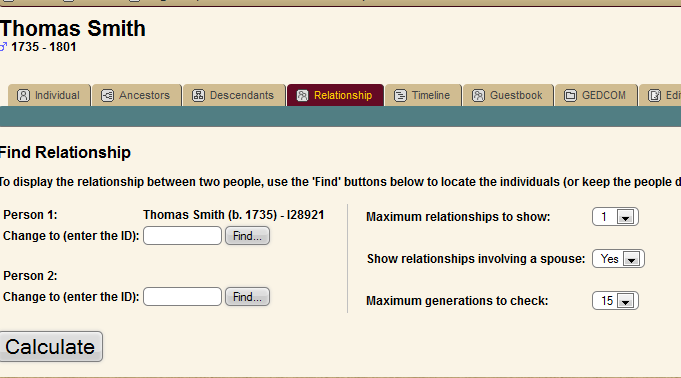 So, on the TREE side, suppose you wanted to compare Thomas Smith to see what relationship he has with John Smith. There will NOT be a relationship, because the utilty below is analyzing this from the TREE standpoint and at this point in time it is simply not known HOW that person may or may not be paper tied to John. So you can ONLY compare people with each other on the tree side who actually have a listed connection with another person. And really, that’s the point of the DNA project, is to narrow down the field of Smith surnames to targeting research where you may match another person via DNA while not knowing the Smith tree relationship.